Yesterday Sarah fell in the stream. It was such a glorious, dare I say, WARM morning that the 8 of us went outside; the dog, the four cats, the rabbit, Sarah, and I. Sarah played by the rabbit cage with her little toy animals, a bowl of water for a lake, and a piece of wood to be the land. I set up a lawn chair with my bag of outside goodies; old magazines, scissors, glue, pens, books, camera, coffee, sunglasses, and a blanket in case of chilly winds. 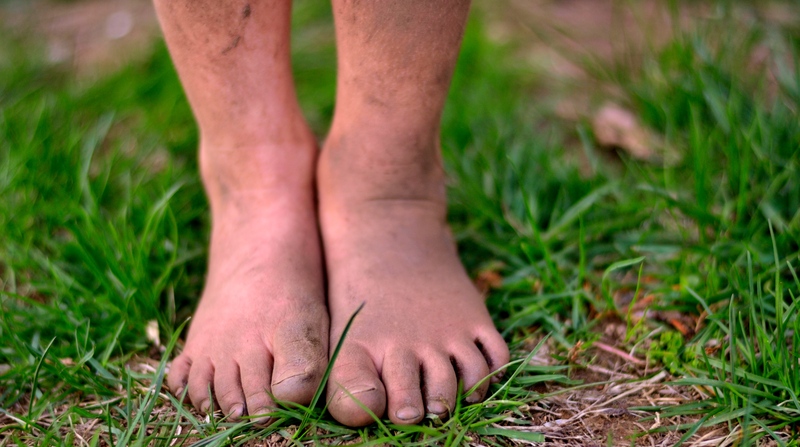 A feeling of contentment was all around us but soon Sarah wanted to make mud pies instead and I readily agreed. In order to make mud pies she went away down the hill to her sandbox and trucked water back and forth from the pond, to the sand. Every once in a while I would look up from my book and watch her. She was so cute with her short blond hair flying behind her as she ran, so busy, so carefree. She ran up to me once or twice to show me how dirty she was getting. Time went by. Eventually, I stopped reading my book and listened. I thought I heard something. I thought it was music and started to read again. The music got louder. I thought Sarah was in the garage, singing. The music got even louder and only then did I realize it was the distressed sort of “singing”, it was screaming and crying, actually. If a child has the energy and will to cry really loud then I do not worry, but the children have a talent of getting me to run. I couldn’t see her at all so I was able to use my amazing imagination to convince myself she was broken and/or bleeding. I couldn’t get to the stream fast enough. I knew she was fine as soon as I saw her, and laughed. She was standing in the rushing waters on a huge rock, wet from waist to toe. She was frozen in terror. I picked my way down the bank cursing the ticks to offer her my motherly hands. I got her safely up the bank and she stopped sobbing. I thought it would be funny to *not say a word* to see what her first remark would be after her adventure. I had to get a bug from my coffee. The twentieth time reading an LM Montgomery book is just as good as the first. When I was a teenager I was very protective of my paperbacks and used to reinforce the corners and binding with tape. 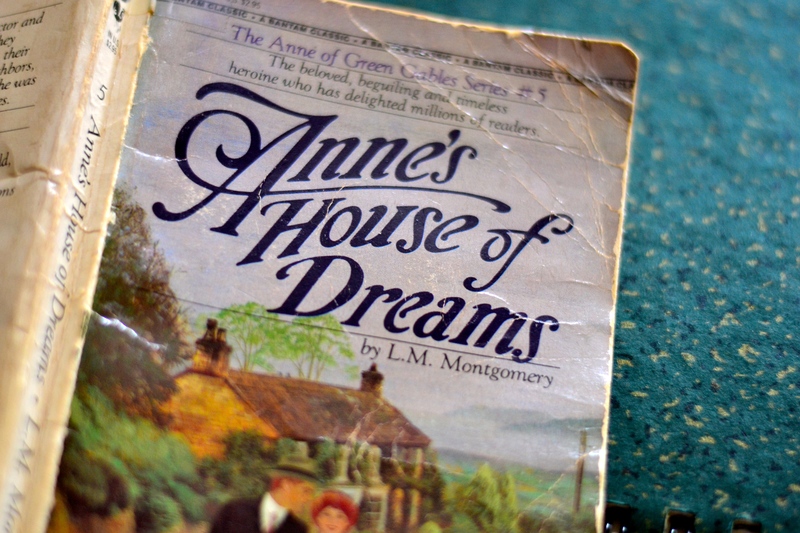 However, the best loved books ended up looking similar to this copy of Anne’s House of Dreams. This book is extra special because it’s the only one I accidentally dropped into a bowl of leftover chicken soup after an late night excessive indulgence of reading, and there it stayed until morning. Every time I pull it from the shelf I think of chicken soup. I still grieve. 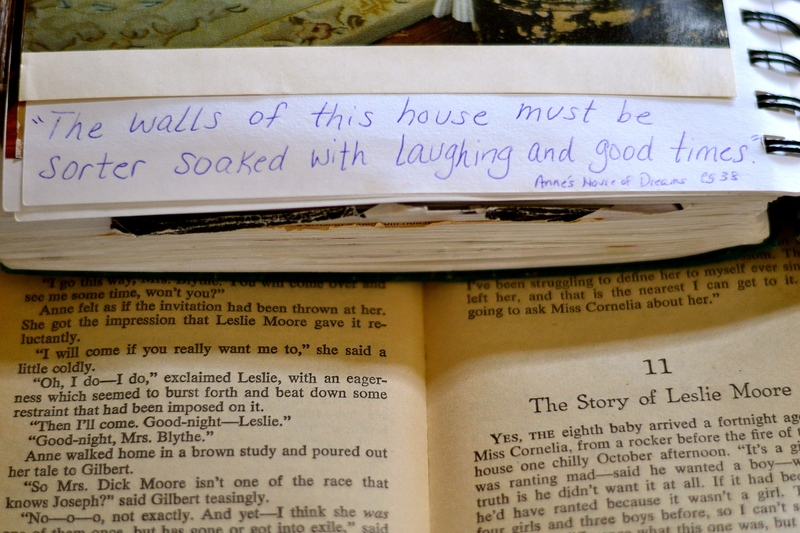 Anne’s House of Dreams begins at Green Gables in the midst of wedding preparations. 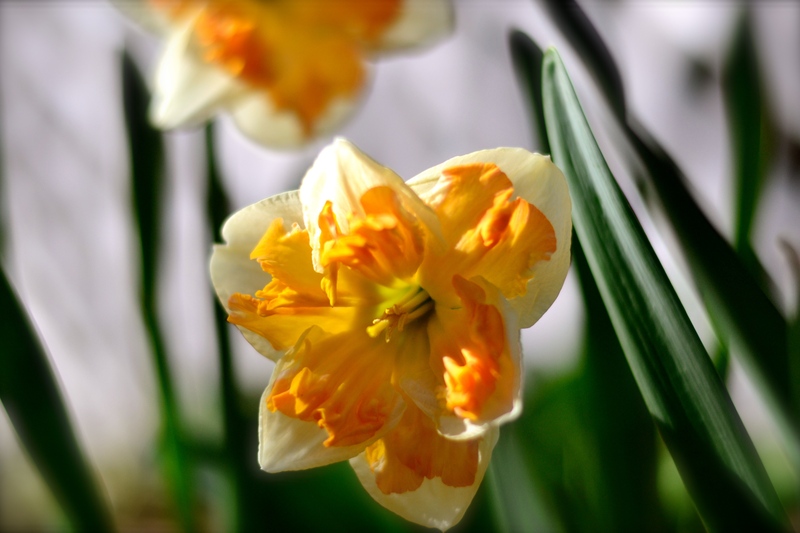 Anne and Gilbert are married in the garden and move away to Four Winds Harbor, near Glen St. Mary, a town by the shores. They live in a darling house, which Anne declares is their House of Dreams. LM Montogomery was so clever in creating unique and delightful characters and in no time at all the reader meets the captivating Captain Jim, Leslie Moore, and Cornelia Bryant. Every page is a delight. 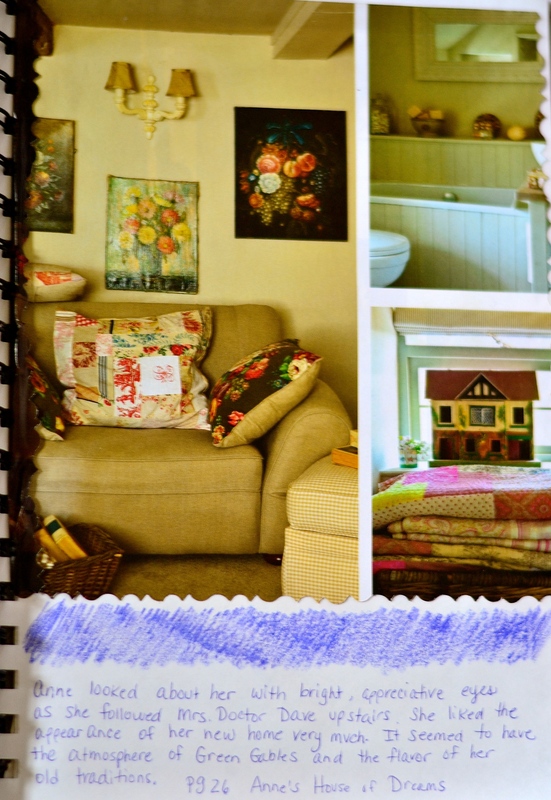 I’ve been in a “feathering the nest” mood this week, hence Anne’s House of Dreams on my reading list, and have been working on completely finishing up my own personal scrapbook of home inspiration. I spend more time on Pinterest these days than looking at magazines, but way back many years ago BEFORE PINTEREST when I was a young thing with no internet, I absolutely delighted in pouring over magazines with a pair of scissors dreaming of what I could do in my home. I’ve been working on this scrapbook for over 10 years……going back to it the last few days was like visiting an old friend. 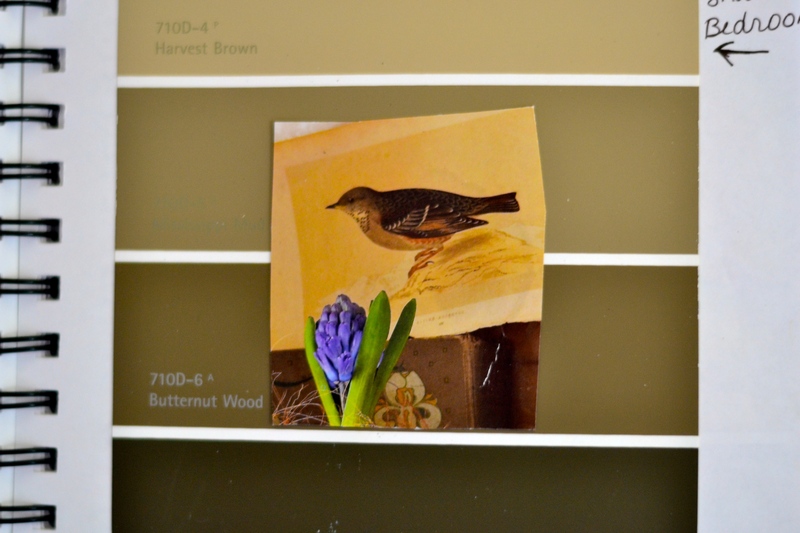 I love the country mix and match eclectic look, with browns and yellows. And books everywhere. Everything about this kitchen is perfection. 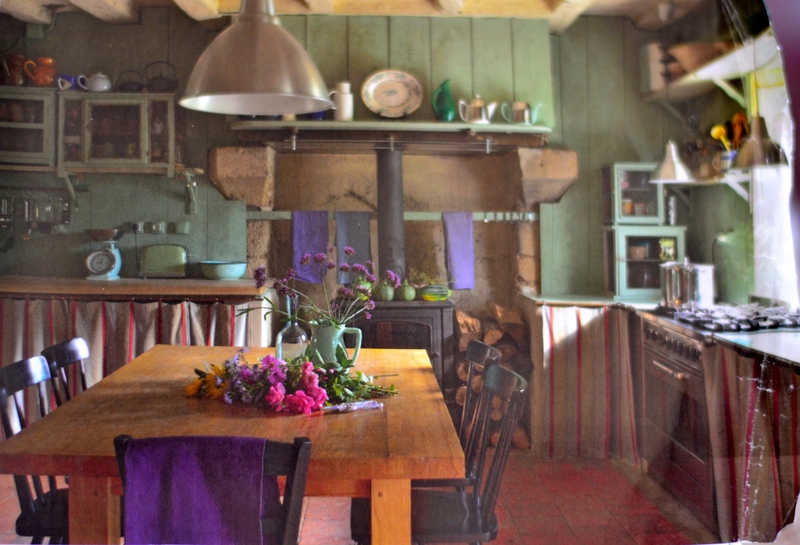 I love the railing behind the stovepipe for towels, the color of the walls, the little cupboards and shelves, red floor. 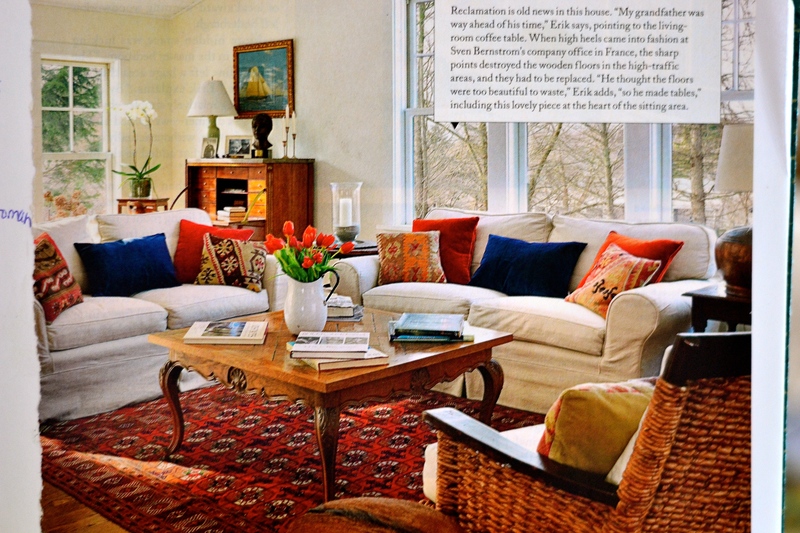 Another room that I love everything about….wicker side chair, all the pillows, the blue ship painting, no curtains on the windows, flowers……the colors….. This is my Home and House board on Pinterest: click HERE. It’s much easier to pin photos online now and…… I have let my Country Living magazine subscription lapse. But I hope I never stop taking the time now and then to sit “the old fashioned way” with scissors, glue, a scrapbook, and a handful of dreams á la Anne Shirley Blythe. 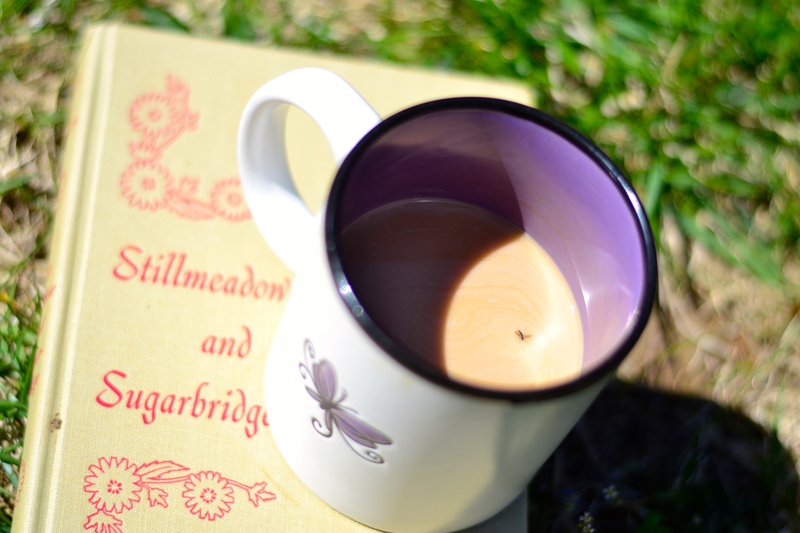 This entry was posted in home, it's the little things, quotes and tagged books, homemaker, journals, LM Montgomery by Shanda. Bookmark the permalink. I think she cried because she was startled, the water was like ice! I know, we are all attached to the internet nowadays. Hard to imagine life without it. Sometimes I wish that were still the case. You are such an experienced mom, taking Sarah’s plunge so calmly. I am sure she is recalling it with great favor now. So cute. Spring sounds delightful. We are in full summer mode already, and the jasmine is blooming out by the mailbox. Smells heavenly. 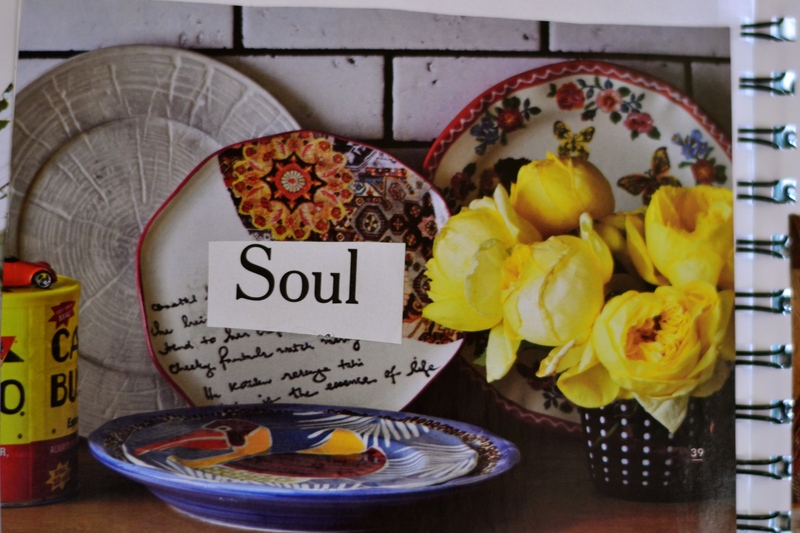 I have always loved your scrapbook of ideas, as well as Anne! Those books are a treasure. I like so many of the same things that you like-color, books, quilts. 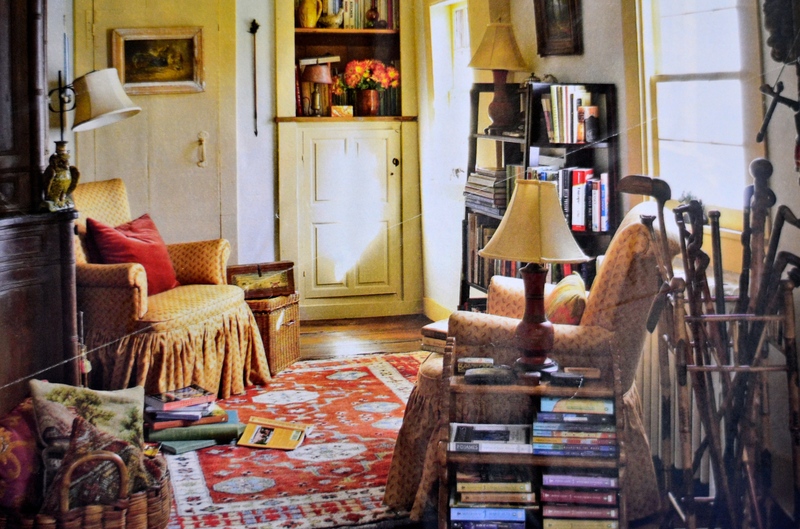 I visited an older friend once and admired her chairs, all upholstered in patchwork quilts. She said, “oh, i did that myself, I was too cheap to have them redone.” I thought her version was special. Yes, we have a lot in common, which is why we both gravitated toward each other here in blogland! Those chairs sound fantastic! Oh I’m so glad Sarah is ok! I need to get back to my magazine clippings and quotes! I always enjoy your posts and photography so much! I always marvel at your creativity. My favorite scrapbook pic is the second one. It’s kind of the ‘feel’ I’m shooting for as we fix up our old house…which is coming along slowly…but we are making progress, so all is well. Poor Sarah! Glad she’s okay. Oh how I sometimes miss the days before pinterest.and the internet. But I also love pinterest and the internet. 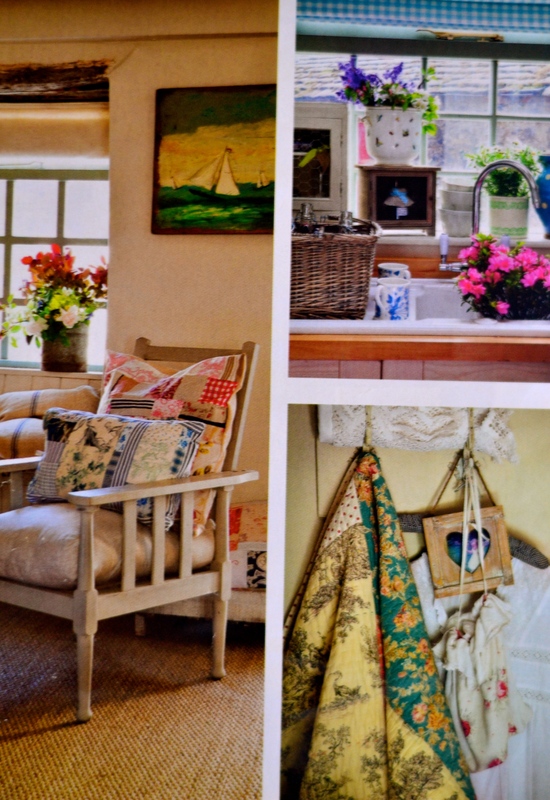 Sadly I too have let my Country Living subscription lapse…I find all the pictures from the magazine on their website and in their facebook feed. I love the pictures from your scrapbook. They are all so cozy. Especially the kitchen one you love so much.